Dutch pagan folk metallers Heidevolk from Arnhem will release their 6th full-length album “Vuur van Verzet” on January 12th, 2018 via Napalm Records. Heidevolk are the pagan metal brotherhood. These Dutchmen hold up the flag for intelligent and perfectly balanced pagan folk metal like no other. Marvelous riff power, bombastic ensembles and folkloric tunes make up the amazing album that is “Vuur van Verzet”. Brave chants bring to mind wolf-like bands of warriors, while songs like “The Alliance” send the listener on endless odysseys into the depths of history. Martial male choirs accompany the hymn of Odin’s spear, “Gungnir”, while Lars and Jacco shine in baleful duet as sharp as the weapons point. 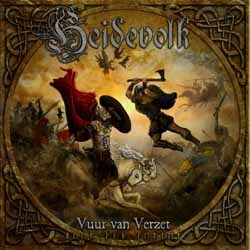 “Vuur van Verzet” (Fire of Resistance) is a perfect blend of folk metal and pagan metal fashioned the Heidevolk way. The band states: “Friends, we are excited to announce our long-awaited new album “Vuur van Verzet” (“Fire of Resistance”). An album that catapults you to a battlefield where a failing Roman empire is retreating and Germanic tribes are on the rise to claim back what is theirs. It will guide you through the great migrations and tell the tale of early traditions, gods and nature. We’ve fitted these stories in 11 songs that emphasize the characteristic Heidevolk sound, but also underline the progression of our songwriting. Fast metal riffing combined with a our trademark dual male vocals, a 24 piece male choir, various folk musicians, a string ensemble and the raw guest vocals of Primordials’ Nemtheanga make “Vuur van Verzet” an album that shows its teeth..in a bombastic way. Join us, the Pagan Metal Brotherhood is on the rise”! Heidevolk will be hitting the road for an European tour run together with their label mates in Arkona as well as Finnish folk metal superstars Korpiklaani and true Norwegian Balkan metallers Trollfest in 2018. Check out all dates in the bands’ official pages and make sure to grab your tickets soon.